SAM BENNETT HELD off the challenge of some top-class sprinters to take the biggest win of his career at Stage 3 of the iconic Paris-Nice race in France. The 26-year-old, who is currently with German team Bora-Hansgrohe, surged with 150m to go and pipped the likes of Norway’s Alexander Kristoff, Germany’s John Degenkolb and Marcel Kittel. It ensured a first Irish stage win at the race for 28 years – Stephen Roche taking the Individual Time Trial back in 1989. Bennett lies in 23rd overall, with Dan Martin in 9th. France’s Arnaud Demare finished Stage 3 in 6th but he still retains his overall leader’s yellow jersey while he keeps hold of the green jersey too. Bennett started his professional career with An Post-Sean Kelly in 2011 before moving to Bora Hansgrohe in 2014. Belgian-born, he is the son of Michael Bennett, a former player and manager with Waterford United. 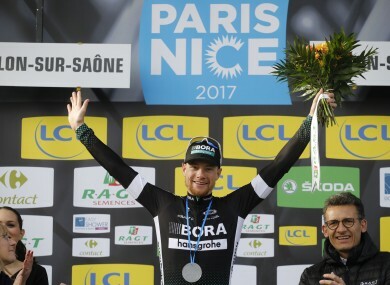 Email “A first Irish stage win at Paris-Nice for 28 years as Sam Bennett delivers career-high performance”. Feedback on “A first Irish stage win at Paris-Nice for 28 years as Sam Bennett delivers career-high performance”.